The 11th arrondissement (XIe arrondissement) of Paris is an edgy, ethnically diverse area of the city that houses sights such as the Place de la Bastille and its majestic modern opera house. It's also a huge draw for students and fans of nightlife, offering a disproportionate number of the city's hippest bars and clubs. The 11th arrondissement is a draw for shoppers and those looking for a cool bistro. The neighborhood and the boutiques and trendy restaurants around Rue de Charonne are especially good. Place de la Bastille (shared with the 4th and 12th arrondissements) is centered by at the imposing Colonne de Juillet that looms over the enormous square. This landmark, the "Trois Glorieuses," or the "Three Glorious Days" memorializes the July Revolution of 1830. Bodies of revolutionaries are buried in the monument. Surrounding the square, are night clubs, cocktail bars, tree-filled parks, markets, and boutiques. Bastille Opera is a modern steel and glass building that serves as home to The gleaming steel the National Opera. Inaugurated in 1989 and designed by Carlos Ott, the Opera Bastille is worth seeing, both inside and out. You can take a guided tour of the theater and backstage and attend performances. Cirque d'Hiver is a circus hall built in 1852, one of the oldest in Europe. Each winter, there is a new show with an international cast of artists. You'll see clowns, animals, acrobats, trapeze artists, tightrope walkers, dancers, and jugglers in this iconic show. Oberkampf neighborhood is known for its vibrant nightlife scene. Rue Oberkampf and surrounding streets have row upon row of hip, chic bars. Gentrified streets around Rue Vieille du Temple are known for both new and traditional designers old craft workshops. Rue Charlot has upscale boutiques and galleries. A highlight is the Marché des Enfants Rouges, the oldest market in Paris dating back to 1615. Edith Piaf Museum (Musée Edith Piaf) was once the private apartment of Edith Piaf, the singer famous for "La Vie en Rose" and "Milord." You'll see her personal mementos, a collection of earthenware, and her famous black dress. Maison des Métallos is a former metalworkers' house and currently an arts and culture center. Place de la République is sadly known as the square where everyone gathered to mourn after the terrorist attacks in January 2015. Now, it is quiet and filled with benches and chairs where people can relax. 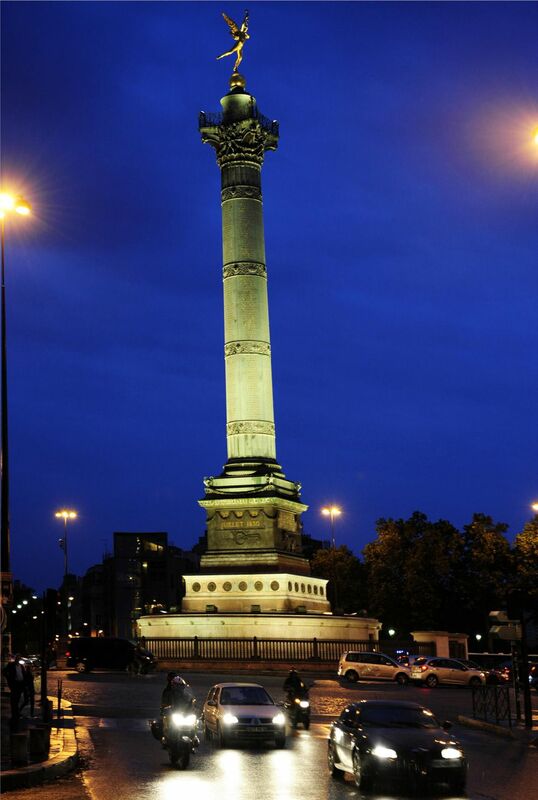 The "Monument à la République" is a monumental statue rising in the center of the square. Surrounding the square you will find bars, concert halls, nightclubs, and theaters. Located on the right bank of the River Seine, this is a densely populated neighborhood with much to see. There are a number of Metro lines that will get you there. Line 9 runs the length of the Boulevard Voltaire, which goes through the 11th Arrondissement from Place de la Republique to Place de la Nation. Lines 2, 3, 5, and 8 all also stop in areas within this large neighborhood. You can also get there by bus.